What a superb night of racing, wow!!! HISTORY MADE FOR HUSQVARNA AT SUPERCROSS FINALE! OSBORNE’S 250SX EAST CHAMPIONSHIP A FIRST FOR HIM AND HUSQVARNA, ANDERSON CLAIMS A WIN IN 450. 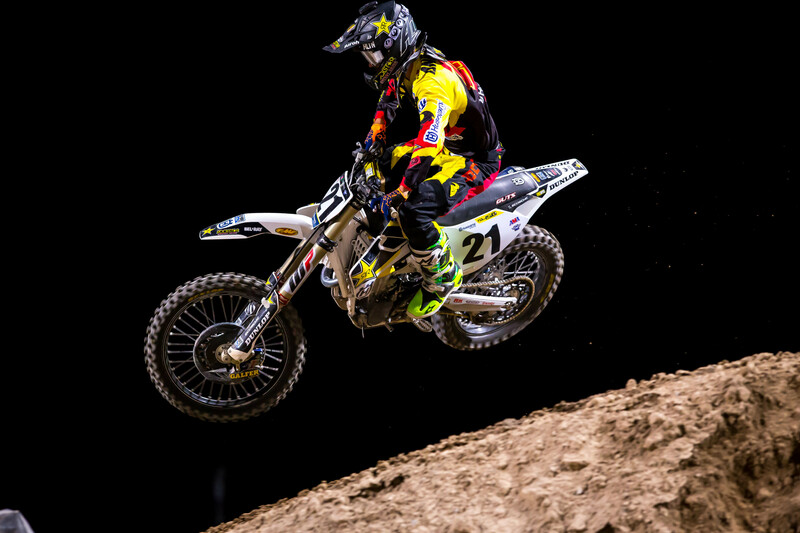 It was an exciting night on Saturday for the Rockstar Energy Husqvarna Factory Racing team! Sam Boyd Stadium in Las Vegas, NV hosted the final Supercross race of the season, and it didn’t disappoint. Only one point out of the lead, Zach Osborne did what he had to do and charged from last to seventh to bring home the 250SX East Championship! 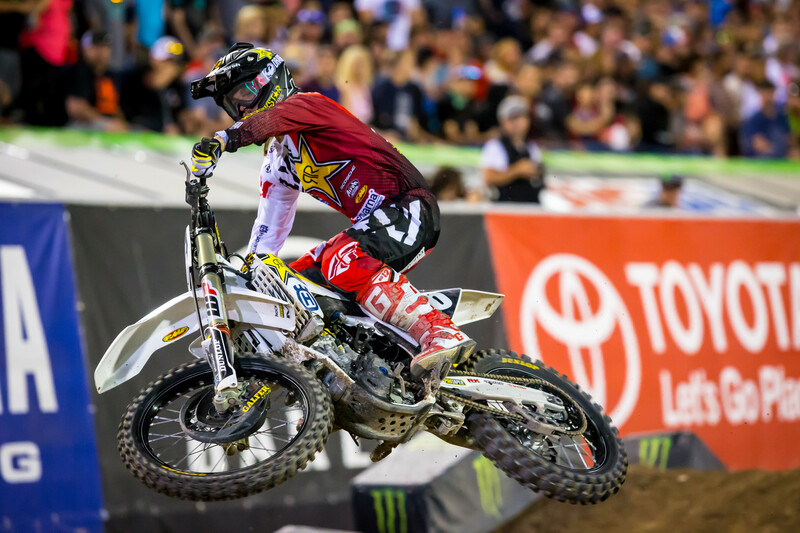 Teammate Jason Anderson claimed a victory in the 450 class, while Dean Wilson earned a top-five finish. Martin Davalos finished 18th in the 250 East/West Shootout after a crash. Zach Osborne had one amazing night. One point out of the lead, he lined up for the 250SX East heat with the championship on his mind. He got a good jump off the gate but was pinched off and went down in the first corner. He remounted quickly, but was forced to battle through the pack from dead last. He made it up to 12th with a minute and a half to go. After battling a bit more, he was one spot out of a transfer position and had two laps to go. He put on a charge and made two last-lap passes to finish eighth and land a spot in the 250 East/West Shootout where he would battle for the championship. He got a decent start in the Shootout but went down in a first-turn pileup. With his hopes for a championship dwindling, he remounted in last, but continued to forge ahead. He started kicking it into gear and battled up to 13th with three minutes to go and continued to push. 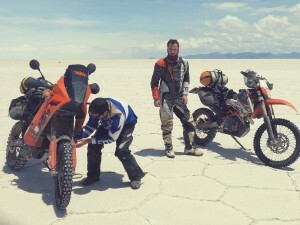 With a glimmer of hope and the heart of a champion he blazed through the pack to put on the most amazing ride of his life. He charged up to eighth and only had to pass one more rider, the current points leader in the class, to gain the advantage. With one lap to go he rocketed his Husqvarna FC 250 forward and made a definitive pass in the second-to-last corner to overtake the points lead and claim the 250SX East championship! Congratulations, Zach! Jason Anderson, the fastest 450 qualifier of the day, got a top-five start in his heat. He battled between third and fourth before tucking his front end in and going down while exiting the rollers with two minutes to go. He remounted in seventh, finished seventh, and would have to earn his spot in the main through the 450 semi. He got the hole shot in his semi and started pulling away. He charged ahead and earned his third semi win of the year with an 11 second lead. He was in the top-five at the start of the main, fourth by the end of the first lap and continued to show some serious speed. He overtook the second-place spot in the second lap and looked hungry for a win. He was creeping up on the leader and looking fast. He continued to charge, but fell back to third and kept it steady. The top-five riders got extremely close with around eight minutes to go and prepared for an epic battle. Right in the middle of a freight train, Anderson held his ground then briefly moved back to fourth before capitalizing on a mistake made by the top-three. He put in quick work to overtake the lead and claim the victory! He is currently fourth in 450 rider point standings. Dean Wilson got the holeshot in his heat and showed some serious speed. He fell back to second before putting in an impressive charge through the whoops to make the pass for the lead. He fell back to second, but stayed aggressive to finish second and earn a spot in the 450 main. He got a top-five start in the main but fell back to eighth soon after. He continued to push aboard his Husqvarna FC 450 and stayed consistent in eighth before moving up to sixth with about two minutes to go. He made one more pass to finish fifth. He ends the season eighth in 450 rider point standings. “I had a pretty good night,” said Wilson. Martin Davalos was third at the start of his 250SX West heat race and started charging until he clipped the back of another rider in a corner and lost his rhythm. He got going again a few spots back, kept it within the top-five, and eased his way back into the third-place spot. He started inching closer to the second-place spot on the final lap as he tried to make one final charge, but he would eventually claim third and a spot in the 250 East/West Shootout. He got a top-five start in the Shootout and moved up to second before and incident put him farther back in the pack. He would eventually finish 18th and ends the season fourth in 250SX West rider point standings.